Sukhoi Company is ready to revive its project on the Su-80 aircraft, but experts expect this will be anything but simple. The company Sukhoi has answered the call of Russian Prime Minister Dmitry Medvedev for the creation of a new jet for regional flights. For Sukhoi, invention of a new jet is unnecessary: the company is ready to pull the nearly forgotten, Su-80 aircraft project back off the shelf. On Aug. 7, Prime Minister Medvedev held a meeting dedicated to the development of regional aviation and asked the Ministry of Industry and Trade and the United Aircraft Corporation (UAC) to negotiate a new regional jet. One of the major reasons for the decline of regional aviation is the lack of modern, affordable jets. In trying to find a solution to the problem, stakeholders even suggested a project to re-motorize An-2 aircrafts, which have been the designated planes for regional routes since the 1940s. It is yet to be known how officials reacted to the revival of the Su-80 project, as the Ministry of Industry and Trade has failed to comment on the matter. However, official UAC spokesperson Olga Kayukova admitted that she had no information about Su-80 production plans. “This model isn’t in the corporation’s line-up,” she said. The future of another Sukhoi project, the Superjet (SSJ), is also an intricate matter. This regional passenger jet was designed in Russia at the turn of the century, with a goal to replace Russian Tu-134 and Yak-42 models. When the SSJ was developed, many experts and professionals branded the project a potential savior of the Russian aviation industry, which had not manufactured any new jets for a very long time. However, initial SSJ test runs revealed a handful of issues. In spring 2011, the Superjet 100 showed engine-related problems during its first commercial passenger flight. A year later, in May 2012, an SSJ-100 with passengers aboard crashed in Indonesia, leading Armavia to cancel its Superjet contracts. Most recently, another SSJ aircraft was forced to make an emergency landing at Moscow’s Sheremetyevo Airport due to cabin decompression. The Su-80 program was shut down only a few years ago. 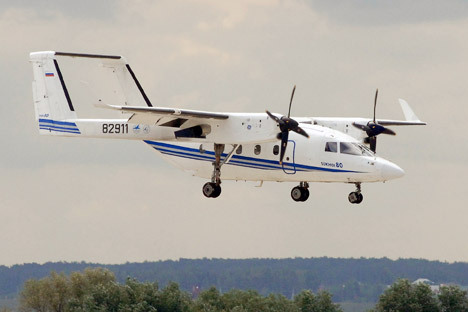 According Sukhoi Company’s website, the Su-80 is a multi-purpose, mixed-cargo aircraft designed to carry up to 30 passengers or, alternatively, cargo weighing up to 7,275 lbs; the aircraft can fly both commuter and regional air routes, any time of day, in any geographical setting, and under favorable or adverse weather conditions. The Su-80 was designed to replace An-24, An-26 and Yak-40 aircraft models. It is outfitted with two ST7-9B turboprop engines developed by American dynamo General Electric (GE). The plane’s takeoff and landing performance, bolstered by a specialized landing gear and low-pressure tires, make it possible to use the Su-80 on small airfields that may even have unpaved, iced-over or snow-covered runways. The Su-80’s hallmark is its seamless convertibility, i.e., the speed with which the aircraft can be reconfigured from a passenger plane into a cargo carrier, and vice versa. The cost of manufacturing the jet varies from 230-280 million rubles ($7.1-8.7 million), in 2006 prices. Sukhoi “forgot” about the Su-80 when it started to work on the Superjet (SSJ) project, told Aleksey Sinitsky, editor of the Air Transport Review. “The project is interesting. Russia even tried to cooperate with the Chinese on it. But it has very much been forgotten and no one knows how much it will cost to revive the jet,” Sinitsky said. According to him, the Su-80 might be reborn, since the government has decided to pursue a renewal of aviation projects; but questions will remain concerning the aircraft’s price and after-sales maintenance. “We are ready to revive the Su-80 in support of Russia’s national economy. We can build them at our plant in Komsomolsk. But no one has brought forward a strategy for the development of civil aviation yet,” Yevgeny Konkov, Vice President of Finance for Sukhoi, told reporters. According to him, Medvedev’s government only set an objective for the number of seats in new regional jets. Nothing was mentioned regarding which airfields the new jets should operate on or which engines they should be equipped with. First published in Russian in RBC-Daily.